Progressive municipalist city governments from Barcelona, to Naples, to Grenoble have introduced important policies to promote citizen participation, public ownership of services, expanded affordable housing, urban ecology and sustainable energy, better transparency and accountability, and many more. But their radical democratic programmes face obstacles from both EU and national neoliberal legislation. Despite this, cities can and are finding ways to bypass these hurdles. However, the upcoming revision of the EU’s Bolkestein Directive - an update of the 2006 directive to liberalise services in Europe - could have a real chilling effect on their plans, obliging municipalities to ask the European Commission's permission for new measures. This would create major obstacles to progressive municipal policies that challenge neoliberalism, such as limits on AirBnB aimed at protecting affordable housing, or the public provision of renewable energy. In recent years, numerous cities in Europe have turned their back on privatisation of water delivery after disappointing experiences with private water corporations, including lack of investment, secrecy, and excessive prices. As in other parts of the world, a re-municipalisation wave has arrived in Europe, with Paris and Berlin the biggest cities taking water delivery back in public hands.1 The largest number of re-municipalisations has taken place in France, the country with the longest history of water privatisation and home to the leading global water multinationals (Suez and Veolia). No less than 106 French municipalities have returned to public management of water delivery in the last 15 years. The phenomenon clearly goes far beyond municipalist and other left-wing administrations; re-municipalisation has been initiated by politicians of a variety of political backgrounds. The EU’s strong emphasis on the ‘smooth functioning’ of the single market risks undermining a variety of municipalist policies. One key example is the Brussels lobbying by online accommodation platforms like AirBnB, which have had a dramatic impact on access to affordable housing in many European cities. Huge numbers of properties are turned into largely unregulated tourist flats, and become unavailable for long-term rental to locals. As Corporate Europe Observatory’s report 'UnFairBnB' shows, online rental platforms are fiercely lobbying the European Commission to defeat the measures cities such as Berlin, Brussels, Barcelona, Paris and Amsterdam have put in place to protect affordable housing in the face of the AirBnB onslaught. AirBnB argues that such measures violate single market legislation. There are indications that the European Commission is considering challenging some of these cities on measures they’ve introduced. Siding with AirBnB and other corporate platforms against cities that have taken measures to protect affordable housing for their citizens is clearly unacceptable. It would be a horrendous example of how the EU’s neoliberal orientation in the last few decades has created a framework that protects corporations and throws up hurdles for policies that go against the neoliberal logic. The only legitimate role for the EU would be to support municipalities that protect the public interest against corporate greed. 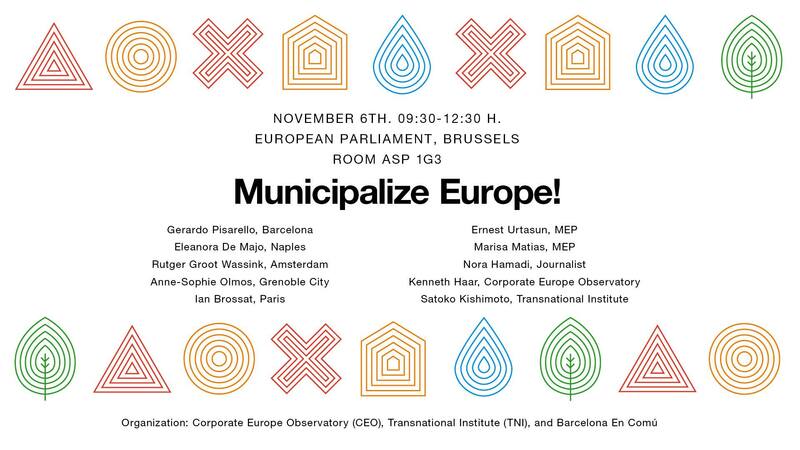 Municipalize Europe! On November 6, municipalist councillors from Barcelona, Naples, Grenoble, Amsterdam, Paris, and elsewhere will meet at the European Parliament in Brussels to discuss how EU institutions are affecting life in their cities and to present their agenda for the 2019 European elections. The event, co-organised by Corporate Europe Observatory, will be live-streamed.